Author: Triola, Mario F. Publisher: Pearson. Edition: ISBN: 0321836960. Condition: New! From SAT scores to job search methods, statistics influences and shapes the world around us. Marty Triola s text continues to be the bestseller because it helps students understand the relationship between statistics and the world, bringing life to the theory and methods. Elementary Statistics raises the bar with every edition by incorporating an unprecedented amount of real and interesting data that will help instructors connect with students today, and help them connect statistics to their daily lives. The Twelfth Edition contains more than 1,800 exercises, 89% of which use real data and 85% of which are new. Hundreds of examples are included, 91% of which use real data and 84% of which are new. New coverage of Ethics in Statistics highlights new guidelines that have been established in industry." 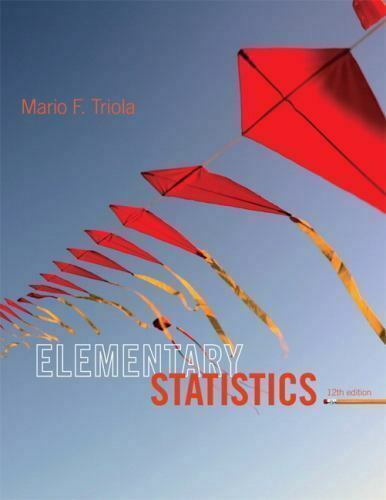 item 5 Elementary Statistics (12th Edition) by Triola, Mario F. -Elementary Statistics (12th Edition) by Triola, Mario F.
If you are looking for a book that will show you step-by-step statistics--don't buy this book. The book itself has good content, and commentary stories but is really for an advanced user. The book is a textbook. Content not completely approachable for an intro student, but as a teacher, I LOVE the problems and technology projects, and would teach from this text if I could. Highly recommend as a resource.